383 Stroker supercharger - 2019 Mechanic Guides! Owning a 383 Stroker gives you a lot of options for power configurations, after all, it’s an upgraded 350, so you already started to play around with the engine block. One of the best ways to add some extra power to any engine, but specifically to a 383 is by adding a supercharger. Now a supercharger does have an impact on your engine’s performance, the very fact that its connected directly to your camshaft and uses a belt to drive the air turbine is added wear to an already upgraded engine. As such, you want to have a solid base to start off with, and when you add a supercharger to a 383 Stroker engine, you will blast the beast over 500 hp and 500 lb-ft of torque. This means that you need to have good supportive rods and pistons that will be able to handle the extra power a supercharger pushes. Remember that any engine with a supercharger (blow engine) needs to have upgraded components to support it, and this includes the block itself. You will want all the critical areas of the block to be precision machined and have the block decked and squared. You will also want a solid rotating assembly that includes 4340 forged I-beams and bushed connector rods, forged and coated pistons and rings with Clevite 77 bearings. To be able to stand up to the extra power of a supercharger you will want state-of-the-art heads that are CNC ported with a 23-degree angle-plug. The heads must be eitehr forged or die cast aluminum that provide at least 210cc of intake airflow and couples them with 80cc fast-flowing exhaust ports. Make sure the combustion chambers are also CNC ported and are 76cc. The intake valves must be 2.08 inches, and the diameter of the exhaust should be 1.60 inches. Exhaust 244 degrees and 0.600 inches. For the other ancillaries, I suggest a Milodon oiling system that can stand up to the added pressures and delivers smooth moving lubricated components. What I preferred to use was the Weiand 177 Roots mini-blowers. This is a small beast that delivers explosive power and will up your 383 to 600 hp. These blowers will work on EFI engines and usually have a carb sitting on their top. In fact, the Weiand 177 is found on many 383 upgrades. 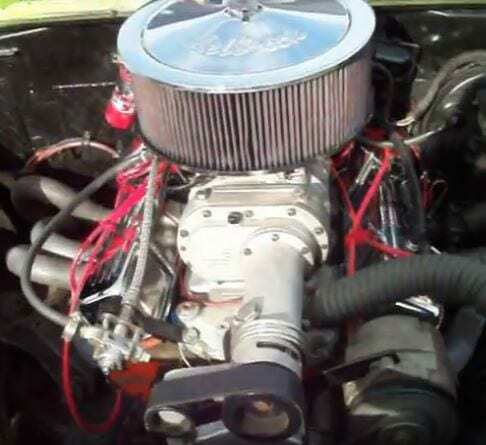 The carb I used was an upgraded Holley 850 double with valve covers. To complete the list of upgrades to support the supercharger (blower) I added a coordinated ignition system from MSD. Superchargers for 383 come in a variety of brands and models, among the best are Weiand, Vortech, Edelbrock, ProCharger, Whipple and more. You get a 100-175+ Horsepower gain based on application, and you increase in torque significantly. You get the instant kick down power, and it gives you a drive ratio with the included pulley set is 1.71:1 on a small block. The pulley uses a serpentine belt and has 10 grooves, it comes with a long nose and is sold as a kit. However, other options you can use include the ProCharger F-1A-94 which is a big beast of a system, and this beast will give you the ability to reach over 1,000 HP on a 383 Stroker, if you complete the kit with all the necessary parts in the block.